So, there I was last night, plinky-plonking away on the ipad’s tiny keyboard with my eyes smarting from squinting in the darkness when I noticed that the TV seemed to be showing rather a lot of footage of people from Boston. I was working with the sound turned down. Why I didn’t just turn the damned telly off, I don’t know. I like the company. Even if it is Jeremy Paxman. I turned the sound up and the full horror seeped through the screen and into my living room. How strange to be working away diligently on a blog post about the history of Tarot cards when some person (I use that term very loosely) was blowing up a whole crowd of cheering, happy people who were simply raising funds for charity. Who would do such a thing? The media speculation begins. So I decided to speculate myself. I reached for my RWS deck, shuffled and drew a card: 8 Cups. This is my take: Whomever is behind the bombing seems to be someone who is disenchanted with how life is for them – those cups are artfully arranged to look like there is one missing. But, of course, there ISN’T one missing (otherwise it would be the 9 of Cups!). Lots of people would be happy with 8 golden Cups, but not this person. They have turned their back on their (comfortable? happy-looking?) life and headed off to seek for truth. But what truth are they finding? There’s no objective truth in an ideology – whatever ideology it might be. Heck, sometimes it’s hard to find a definitive truth about ANYTHING – the sky isn’t blue, mountains aren’t solid, there are sounds and colours that are beyond our capacity to experience, Justin Bieber isn’t that good a singer. Does the red cloak have any significance here, for this question? Matadors have red cloaks. Men who goad bulls to anger and violence? Little Red Riding Hood had a red cloak. She outwitted a big bad wolf. Maybe the only difference between a terrorist (a matador) and a freedom fighter (Little Red Riding Hood) is where you find yourself when he acts out his ideology? My second question was direct – Foreign or Domestic? 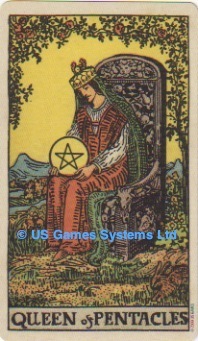 The card drawn is the Queen of Pentacles. She sits in a lush setting and is well-dressed – someone who is not short of a dollar or two. The Queen is not a character that you would associate with any kind of violence. But Pentacles IS the suit of home and hearth. Does this signify a home-grown terrorist? Or does it just mean that the bomber is someone who feels that their hearth and home needs defended against ‘American Imperialism’? Or is it simply to do with money? She’s totally focussed on that Pentacle…. How would you interpret these two cards for my questions? And have you drawn cards about this horrific act to see what the cards have to say? All thoughts are with the people of Boston. 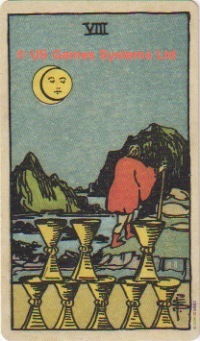 I agree – the Eight of Cups speaks of disenchantment. The Queen of Pentacles is someone who is not necessarily materialistic or focused on money, but someone who is protecting what they perceive to be their "safe place". They could be either a U.S. national, or a foreign national. Young male or males, full of hubris and indignation. Because of isolation and spiritual confusion. I'd say it's a young man with religious delusions. Not much of a stretch, but there it is.